By 12 weeks, puppies must be microchipped. After six months, they must be registered with Council. The one-off registration fee ranges from $28.5 to $207 depending on whether it’s desexed or whether you're eligible for concessions. Dogs must wear a collar with its owner’s contact details when out. Remember, making your dog easily identifiable increases the chances of it being returned to you if it’s lost. So please keep your details up-to-date. Dogs need regular exercise. When walking your dog in a public place, it must be leashed. Don’t let your dog roam free as the consequences can be severe, ranging from a fine to the dog becoming lost or even injured by a passing car. 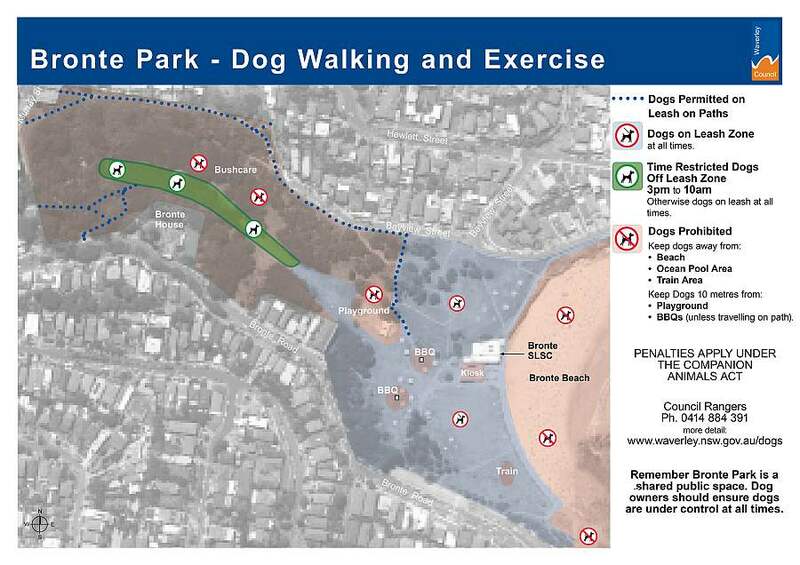 For further information about your responsibility as a Dog Owner in public spaces. please download our Dogs brochure. Please respect these restrictions—they are in place for the safety and enjoyment of the whole community. Barking, in addition to whining, howling and growling, is a dog's way to communicate. Occasional barking is a normal way to get your attention. Make sure your dog gets at least an hour of daily playtime and exercise, early morning is often best. Determine the cause of behaviour i.e. does it have enough shelter, toys? Is it bored, or is it near a busy pedestrian thoroughfare? Once you know, then try different tactics to help fix the problem. Consult your local vet or a recognised animal behaviourist for advice. Some dogs have behavioural problems such as separation anxiety, which might need specific treatment and training. Excessive barking can be serious and cause strained relations with surrounding neighbours, so please try to find a solution. Councils can issue a Nuisance Order if your dog continues to bark, damages other people's property or chases people, animals or vehicles. Make sure you know the whereabouts of your dog. Council is legally obliged to pick up any dog roaming free on a street or public area. If your dog is missing, call Council’s Rangers or the Sydney Dog and Cats Home. Remember, if you want a dog, there are plenty at the pound who would love a new family. For a small adoption fee, you can give a dog a new lease of life. Sydney dogs produce more than 1000 tonnes of waste every day. Owners must pick up and appropriately dispose of dog droppings. We have dog tidy stations installed throughout Waverley. Find food best suited for your dog's age, size and activity level and keep the diet consistent. Always provide plenty of fresh, clean water. It’s good to take your dog for regular checks at your local vet. Unfortunately, accidents and serious illnesses can strike at anytime. Over half of vet visits each year are listed as a sudden illness. Your dog deserves medical attention when needed, however vet bills are often very expensive. Most vets recommend pet insurance so your dog is covered in its time of need and you have peace of mind. Ask your vet for advice. A small fee now can save a lot of heartache later. If you’re going away for a few days, a friend, neighbour or dog care service might be a convenient, safe and cost-effective option. However, if you’re going away for a while, a house sitter or boarding kennel might be better. Your local vet can advise you of a reputable kennel. If you are going to board your dog, make sure your dog’s vaccinations are up-to-date as reputable boarding kennels request a certificate.